I captured a couple of clips of a mountain lion, perhaps the mother from the trio that we saw recently, at a water hole. First, she drank, and then she licked her giant paw, before sauntering away from the water. Here she is on a trail near the water hole. And here is the video of her at the water hole. I hope that you enjoy the short video, either here or at Youtube. What a great video! It's so good to know there are still mountain lions out there. 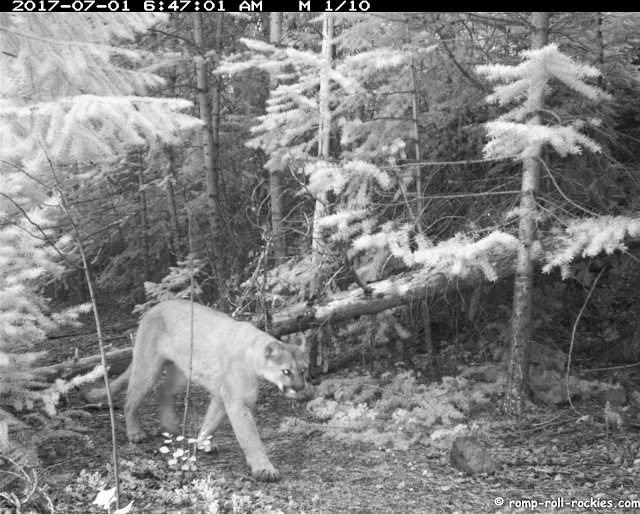 As that mountain lion is walking away from the water, it appears that she is limping...perhaps why she was licking her paw...? I noticed that too. I hoped it was just something very minor... I'll be checking cams again soon so maybe I'll find out something more! That is one huge paw! A.M.A.Z.I.N.G. And the size of those paws. Whoa. Not quite as relaxed as the bears. Can't believe the clarity of the sound. Everyone gets thirsty, and kitties are big on clean paws. With all the heat around, we bet that water was refreshing. Thanks for sharing the video. I love those magnificent animals. I always love these videos. Thanks. We love seeing those big kitties, from a distance! Such fantastic peaks into nature! MY! What big feet you have!